Note: This post is brought to you by The Home Depot. It’s time for another Home Depot DIY Workshop, y’all! And this time I’ll be teaching you how to build a holiday wreath for your front door at The Home Depot in San Antonio, TX! Come hang out with me and learn to craft up this fancy looking, but super easy to make 3-tier wreath! 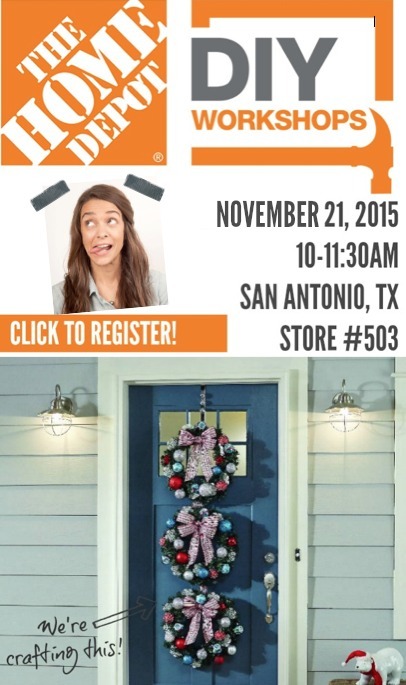 I’ll be at the Home Depot on Fair Avenue in San Antonio from 10-11:30am on November 21. Sign up here for free here! If San Antonio is not convenient for you, boo! I’m sad we won’t get to hang, but, not to worry! You can still attend the free DIY Workshop at Home Depot’s across the country, click here to enter your zip code and find the store closest to you! And if you are lucky enough to live in one of the 3 cities listed below, you’ll get to meet a few of my blogging buds! In-store workshops offer demonstrations with clear, step-by-step instructions for making easy home improvements to your home and yard. The workshop can give you the confidence boost you need to become an awesome DIY-er and crafter! DIY Workshops are held on Saturdays and Sundays throughout each month. I will be in-store co-hosting this workshop on November 21, so please let us know you’ll be attending and REGISTER HERE! Get out the ol’ calendar, tell all of your friends, and mark down November 21st for a DIY workshop at The Home Depot!